Mongoose (plural mongooses) is the common name for any member of the small "cat-like" carnivorous mammals comprising the Old World family Herpestidae, characterized by a long, slender body, short legs, long tail, small and round head with short muzzle, and ears low on the side of the head. There are several species of mongooses in the traditional Herpestidae subfamily Galidiinae that some taxonomists now place in another family, Eupleridae. This would expand the definition of mongoose to those mammals in the mongoose family Herpestidae and those in the subfamily Galidiinae of the family Eupleridae. Mongooses are popularly known, particularly because some have a noted ability to kill venomous snakes. Mongooses also have been utilized by people to kill household pests like rats, and, being easily domesticated, they are often kept as pets. Ecologically, they are important for terrestrial ecosystems as part of food chains, feeding on insects, birds, crabs, lizards, rodents, and eggs, and being food for larger carnivores and birds of prey. 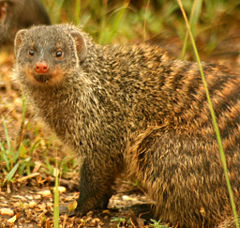 Various authorities state that technically the plural of mongoose is "mongooses," because the irregular plural (policeman to policemen, goose to geese) is not used for a compound word that is not of the same nature as the root word; that is, a mongoose is not a type of goose (Pinker 1999; BZ 2007; Viney 2007). There are, however, dictionary references that recognize "mongeese" as an acceptable plural (Merriam-Webster 2007). 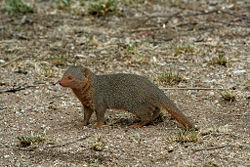 The word mongoose is derived from the Marathi word mangus. Mongooses are members of Carnivora, an order of placental animals that includes such familiar groups as bears, foxes, cats, hyenas, skunks, otters, raccoons, and so forth. Carnivora is typically divided into the suborders Caniformia (dog-like) and Feliformia (cat-like). Mongooses are placed in the suborder Feliformia, and together with the hyenas (family Hyaenidae) and Malagasy carnivores (Eupleridae) are placed in the superfamily Herpestoidea. 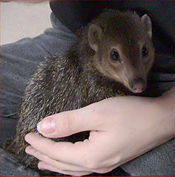 Until recently, species in the Herpestidae family were classified in the Viverridae family with civets (Postanowicz 2007). However, as shown in the works of Wilson and Reeder (1993), the herpestids are genetically and morphologically distinct from the viverrids (Postanowicz 2007). Mongooses are small carnivores, ranging from around 23 centimeters to 75 centimeters, with a weight from less than 1 kilogram to around 5 or 6 kilograms (Myers 2000). Most are brindled or grizzled; few have strongly marked coats. Typical coloration is gray or brown and of a single color, with the exception of the few that have stripes ((Myers 2000). Mainly African, mongooses also are widely distributed in Asia, the Caribbean, and southern Europe. There are more than thirty species. Myers (2000) lists 34 species in about 20 genera, with several of these genera restricted to Madagascar and placed in their own subfamily, Galidiinae. Note, however, that in 2006 some have reclassified the galidiines into another family Eupleridae, and list only one subfamily of mongooses, the Herpestinae, consisting of about 29 or 30 species. Mongooses mostly feed on insects, crabs, earthworms, lizards, snakes, chickens, and rodents. However, they will also eat eggs and carrion. Some species, such as the Indian mongoose, are popularly used to fight and kill venomous snakes, even king cobras. They are able to do this because of their agility and cunning, thick coat, and high resistance to the venom, but typically avoid the cobra and have no particular affinity for consuming their meat (Mondadori 1988). Mongooses also have receptors for acetylcholine that, like the receptors in snakes, are shaped so that it is impossible for snake neurotoxin venom to attach to them. Research is being done to determine if similar mechanisms protect the mongoose from snake hemotoxic venoms (Hedges 1997). Some species of mongooses will usually lead solitary lives, seeking out food only for themselves, while others travel in groups, known as mongaggles. In these larger groups, they will tend to cooperate and share food among themselves. The Egyptian mongoose (Herpestes ichneumon) is sometimes held as an example of a solitary mongoose, though they have been observed to work in groups also (Bies 2002). The meerkat or suricate (Suricata suricatta) lives in troops of 20-30 individuals in open country in Southern Africa (Angola, Namibia, Botswana, South Africa). Meerkats are small, diurnal mammals foraging for invertebrates in open country. Their behavior and small size (they weigh less than one kilogram) makes them very vulnerable to larger carnivores and birds of prey. However, the meerkat has been known to eat small birds that migrate through Southern Africa. To protect the foraging troops from predators, one meerkat serves as a sentinel—climbing to an exposed vantage point and scanning the surroundings for danger. If the sentinel detects a predator it gives a loud alarm call to warn the troop and indicate if the threat comes from the air or the ground. If from the air, the meerkats rush as fast as they can to the nearest hole. If from the ground, the troop flees but not quite so fast, as meerkats are more able to evade terrestrial predators than airborne raptors. The mongoose emits a high-pitched noise, commonly known as giggling, when it mates. The giggling is also a form of courtship when this animal is choosing a mate. 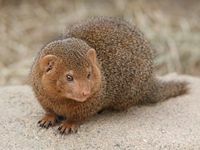 Some species of mongoose can be easily domesticated, are fairly intelligent, and can be taught simple tricks, so they are often kept as pets to protect home from vermin. However, they can be more destructive than desired; when imported into the West Indies for the purpose of killing rats and snakes, they destroyed most of the small, ground-based fauna. For this reason, it is illegal to import most species of mongoose into the United States (USFWS 2007), Australia, and other countries. Mongooses were introduced to Hawaii in 1883, and have had a significant impact on native species (Adamski 2004). Mongooses are a common spectacle for road-side shows in India. Snake-charmers typically keep mongooses for mock fights with snakes. In Okinawa, Japan, there is a tourist attraction where a mongoose and a type of local venomous snake, the habu (one of various Trimeresurus species), are placed in a closed perimeter and allowed to fight, while spectators watch. However, due to pressure from animal rights activists, the spectacle is less common today. 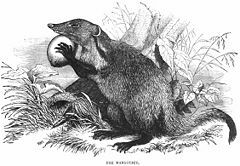 In ancient Egypt, according to the Greek historian Diodorus Siculus (1.35 and 1.87), native mongooses (Herpestes ichneumon) were venerated for their ability to handle venomous snakes and for their occasional diet of crocodile eggs. The mongooses belong to one of four families of terrestrial cat-like mammals descended from the viverravines, which were civet/genet-like mammals. The mongoose family is a close evolutionary relation of the family Viverridae and mongooses are sometimes classified as members of this family. Less diverse than the viverrids, the 30 species and 11 genera of mongooses are assigned to only two subfamilies. The subfamily Herpestinae comprises 30 species of African and Asian mongooses, including the Cape gray mongoose, the Egyptian mongoose, and the meerkat or suricate. The traditional subfamily Galidiinae is a small sub-family of Malagasy carnivores. In 2006, the galidiines were reclassified by some into the family Eupleridae, having previously been considered members of the family Herpestidae. Adamski, M. 2004. Traps set to catch mongoose on Kauai. Star Bulletin, February 25, 2004. Retrieved January 17, 2008. Bies, L. 2002. Herpestes ichneumon. Animal Diversity Web. Retrieved January 17, 2008. Blackpool Zoo (BZ). 2007. Mongoose, mongeese, or mongooses. Blackpool Zoo. Retrieved January 17, 2008. Hedges, S. 1997. Mongoose's secret is to copy its prey. New Scientist, January 11, 1997. Retrieved January 17, 2008. Hinton, H. E., and A. M. S. Dunn. 1967. Mongeese: Their Natural History and Behaviour. Berkeley: University of California Press. Merriam-Webster Online Dictionary. 2007. Mongoose. Merriam-Webster Online Dictionary. Retrieved January 17, 2008. Mondadori, A. 1988. Mongoose. In Great Book of the Animal Kingdom, by M. P. Mannucci and A. Minelli, 301. New York: Arch Cape Press. ISBN 0517667916. Myers, P. 2000. Herpestidae. Animal Diversity Web. Retrieved January 17, 2008. Pinker, S. 1999. Words and Rules: The Ingredients of Language. New York: Basic Books. ISBN 0465072690. Postanowicz, R. 2007. The Herpestidae family. Lioncrusher.com. Retrieved January 17, 2008. Rasa, A. 1986. Mongoose Watch: A Family Observed. Garden City, NY: Anchor Press, Doubleday. ISBN 038523175X. U. S. Fish and Wildlife Service. 2007. Animals whose importation is banned under the Lacey Act. Fish and Wildlife Service. Retrieved January 17, 2008. Viney, M. 1999. Why aren't mongooses mongeese?. Null-Hypothesis: The Journal of Unlikely Science. Retrieved January 17, 2008. Wilson, D. E., and D. M. Reeder. 1993. Mammal Species of the World: A Taxonomic and Geographic Reference, 2nd ed. Washington, DC: Smithsonian Institution Press. ISBN 1560982179. This page was last modified on 8 December 2008, at 23:30.